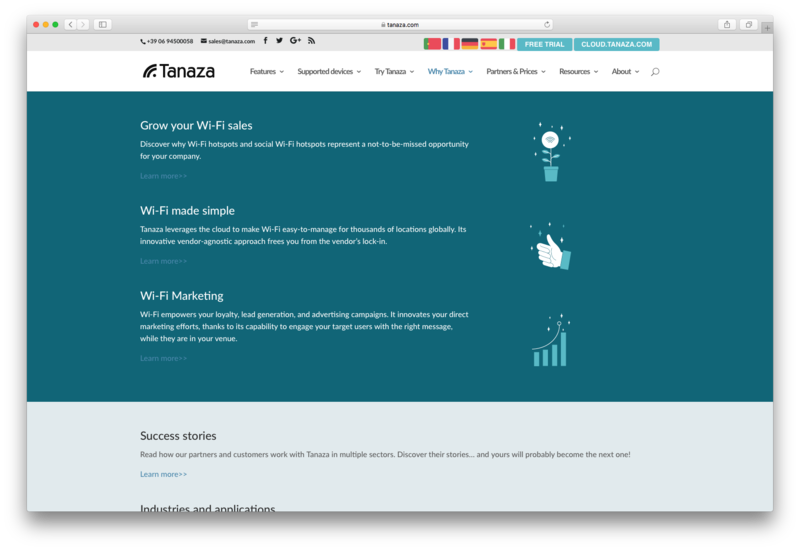 "Tanaza is the first and only software for multi-vendor cloud-based WiFi management, allowing you to setup and monitor your clients' networks and their free and paid hotspots." Tanaza scored 81/100 in the Network Management category. This is based on user satisfaction (87/100), press buzz (36/100), recent user trends (falling), and other relevant information on Tanaza gathered from around the web. Tanaza is one of the first software solutions designed for multi-vendor cloud-based Wi-Fi management that enables users to easily set up as well as monitor client networks. It also allows you to manage both the free and paid hotspots in your establishment. The platform basically adds functionality and empowers any common off-the-shelf Wi-Fi router you might be using in your business, turning it into a cloud-based Wi-Fi social hotspot in mere minutes. This is especially useful for a wide range of establishments and business, including schools, hotels, retail stores and other small brick-and-mortar businesses. Tanaza is a unique cloud-based software solution designed to enable businesses and establishments manage their Wi-Fi network access points through social media logins and other network access methods. It is a time-saving and cost-effective solution for business establishments, regardless of the type of off-the-shelf router they might be using. Remote monitoring – The network management solution allows users to monitor their network and hotspot access points remotely, regardless of the size or scale. The monitoring process is done entirely from the cloud, whether the network is set up in one place or in multiple locations. Centralized configuration – Among the most laborious and time-consuming processes associated with Wi-Fi network management are the deployment and configuration. This is especially true when dealing with vast, multi-location networks. With Tanaza, the deployment, configuration and management processes are all done remotely via the cloud to increase efficiency and maximize cost savings. Application program interface – Tanaza provides an API that allows users to seamlessly integrate their Wi-Fi network, as well as their social hotspot with any existing customer relationship management (CRM) or marketing solution they might be using. Social login and data capture – The platform allows your customers to login to your Wi-Fi network through their social media accounts, which in turn enables you to collect your customers’ valuable personal data for marketing purposes. Login page editor – With Tanaza, creating a responsive well-designed login page for your Wi-Fi network is a lot easier and more convenient. This is due to the platform’s easy-to-use and fully equipped landing page editor. Web content filtering – Tanaza comes with a robust and very effective web content filtering feature, which allows you to keep customers and users connected to your Wi-Fi network from accessing inappropriate content. User-friendly analytics dashboard – All information gathered through the platform’s data capture feature is stored and displayed on a clean, well laid out and easy to understand dashboard. From here, you are able to analyze data and get valuable insights about your customers. Nowadays, managing software systems and applications is much easier and more convenient when it’s all done via the cloud. Apart from the convenience, cloud management is much more efficient, cost-effective and a time-saver. And when you’re dealing with Wi-Fi networks and public hotspots, the idea of being able to manage multi-location networks via the cloud is that much more interesting and appealing. With public Wi-Fi access in virtually every block, consumers are less likely to visit a store or an establishment that has no Wi-Fi network available. That is essentially the world we live in. so if you want to increase foot traffic to your to business or have more walk-in customers, you need a reliable and more stable Wi-Fi access points for your customers. And for you to be able to effectively manage your public hotspots and access points, you need a robust platform that gives you full control of your Wi-Fi network. This is what Tanaza can provide. With a solid, feature-rich solution like Tanaza, you’ll find managing your Wi-Fi network, be it a single or multi-location network, is a lot easier and more efficient. If you own or manage a retail store, restaurant, hotel, salon or any public venue, you want the best customer experience possible to keep customers coming back and convert new ones. And thanks to public Wi-Fi, any business owner can dramatically improve the appeal and customer experience of his or her establishment virtually overnight. Tanaza’s role in all this is to make the login process a lot simpler and more convenient for the customer and the establishment owner. For customers, accessing the Wi-Fi network is a lot easier because they can do it using social media. For the establishment, managing Wi-Fi access is quick and easy, no technical knowledge or skills required. The platform even lets them collect and store valuable data of every customer who connects to their network. Tanaza offers only the best technology available through its robust and highly efficient network management software solution. Users can expect above par scalability and security. And when it comes to technical support service, you can expect complete support through multiple channels for all your Wi-Fi and network management needs. You can participate in the community and communicate with your peers to get the help you need, you can read articles and blogs in the Tanaza support center to gather information about the cloud-based platform, you may download the latest firmware updates and open a ticket to get more personalized support for specific issues you might have with the software solution. Some of the devices supported by the Tanaza cloud-based software solution include TP-Link, Ubiquiti Networks, MikroTik, D-Link, Netgear, LigoWave, Open-Mesh, Alfa Network, Wi-Next, Linksys, PowerCloud Systems and many more. Tanaza offers affordable pricing for all types of users and businesses. They also offer a 15-day free trial with the complete features of the platform. It’s an all-in-one, no limit free trial that is good for up to 15 days. Only then will you be able to view their pricing. 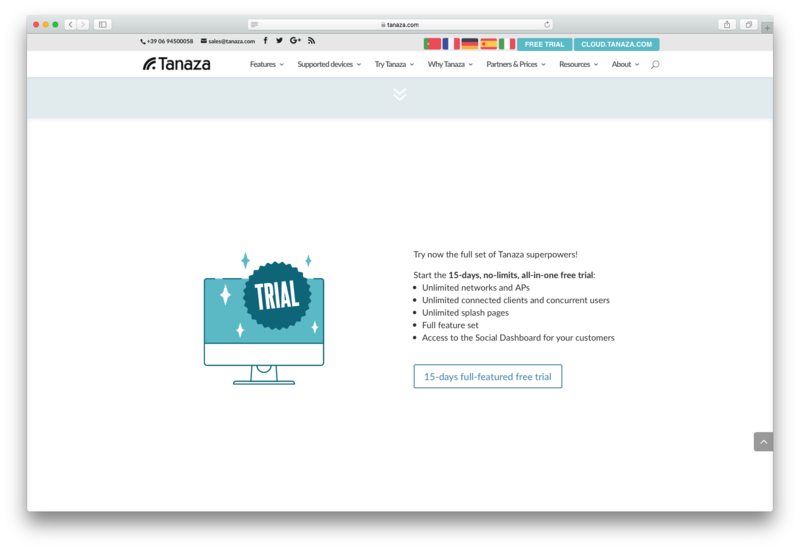 You may visit the Tanaza official website for more information about the cloud-based network management solution or contact their sales team directly for a free demo and quote. Tanaza is a cloud-based network management software solution that adds more functionality to any off-the-shelf Wi-Fi router, turning it into a powerful Wi-Fi social hotspot with easy to navigate access points for all users. It’s the perfect platform for store owners, restaurants and other public venues. The software solution supports a wide array of network devices, allowing for quick and easy deployment and configuration. The convenience and efficiency provided by a cloud-based service combined with the user-friendly and feature-rich Tanaza platform makes for a network management software solution that is worth checking out. Product recommendations, vendor rankings, market overview and tips on how to select Network Management software for business. Published in April 2019. Does Tanaza integrate with any other apps? What is Tanaza generally used for? Does Tanaza offer multi-user capability (e.g. teams)? Who are the main user groups of Tanaza? What platforms does Tanaza support? Does Tanaza offer guides, tutorials and or customer support? Does Tanaza offer an API? What are some applications Tanaza is commonly used in tandem with?